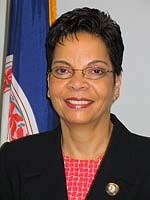 For the month of September, DAAV features Ingrid Morroy, who is Arlington County’s Commissioner of Revenue. Ms. Morroy proudly embraces her mixed ethnic identity. Her maternal grandmother was Indonesian, while her paternal grandmother was both Chinese and black. Additionally, Ms. Morroy’s grandfathers were Dutch on her mother's side, and mixed white and black on her father's side. We recently interviewed Ms. Morroy to learn more about her experiences serving at the local level. This month DAAV highlights Delegate Mark Keam (D-Fairfax), the first Korean American elected to Virginia’s General Assembly in 2010. He represents Virginia's 35th District. His record accomplishments in the state legislature includes promoting public schools and higher education opportunities, as well as supporting small businesses and the region's entrepreneurs. Mr. Keam recently shared with DAAV about what makes an effective AAPI leader for our communities and beyond.